Isn't the 24 Tudor license plate bracket the same as the 24 Coupe? Langs has them in their catalog. Page 84 Item no.3664. Its like the one on my 24 coupe. The rear plate goes on the spare tire bracket. Rear license bracket.....They are all the same, open or closed car. The license bracket is one-piece and includes the tail lamp socket/housing. 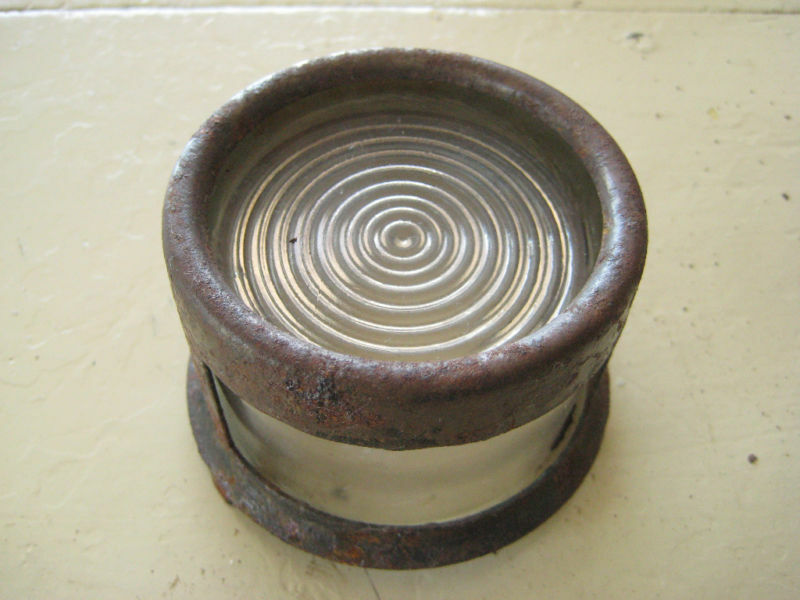 That part is covered with a metal cup, containing the 'tea cup' glass, over which is the red celluloid lens. Mounts to the spare tire bracket. Mounted on a Tudor spare carrier. Note, this T has an aftermarket accessory 'stop' lamp fitted. You can get the tail lamp license plate bracket complete with lamp in repro from the T vendors. Or you can adv. in classified/swap meets, for an original, and get new parts that may be missing. If the photo of your car in the profile is the one you are looking for, you need the rear spare tire mount, looks like you have the front one. That's what the plate and tail light mount on as John has stated. 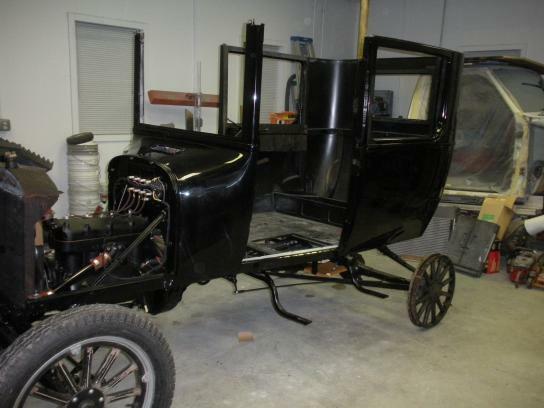 Depending on when your car was made, 21's were an option for 1925 up, so you may be looking for a small window in 1925 for a closed car of the pre 26 model that would have had a tire carrier for the 21" wheels in the old style with the light and plate mount on the crossbar. 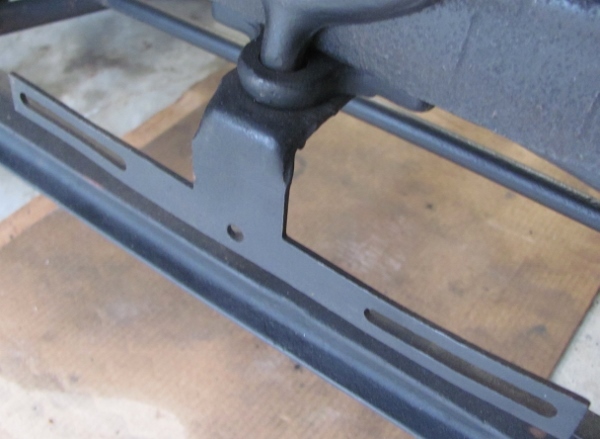 One of ways you could take care of the problem is to use the 26/27 closed car spare tire carrier for 21 inch wood wheels and mount the 26/27 light and bracket on the fender or make a mount for it on the carrier. The tires in Ken's profile look to be 21's so the regular mount for 30 will not work. Your 24 Tudor is looking pretty nice Ken. It takes time to do a complete restoration but persistence pays off! Dan T's pic of the front license bracket looks like a aftermarket. Not sure about that one. The bracket on my 24 looks like the one in Langs cat. It was on my 24 when I inherited it in the 50's. It took about 3 years to complete the restoration on my Grandfathers 24 Coupe. Along the way in researching to try to have an authentic restoration I found like others before me that the 24-25 closed cars have some lap over between years that make getting a T 'correct' a head scratcher. One thing was putting the tail light license bracket in a correct location. In pictures of closed 24-25 T closed cars the tail light was in the center and sometimes off to the left. And that was on cars that were built and off the assembly line in the same time frame! I thought it to do with the difference between the 21 and 30x3 1/2 tire but it still wasn't always mounted the same. ??????? Its your choice I guess. After looking for a tail light bracket and light I finally spent the money and got the repo that Langs sells. Mine was mangled and beat up to much. It is really nice and a quality tail light bracket assembly. Well worth the money. And I mounted it off center to the left! 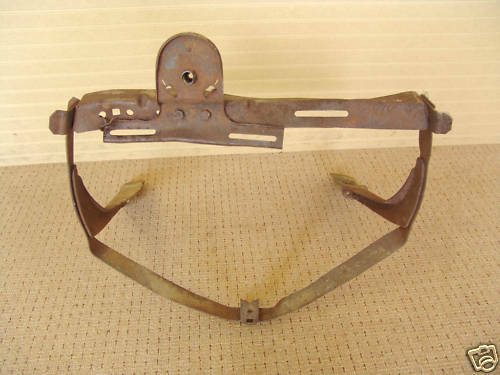 The front license bracket Dan pictured above is indeed a factory '26 - '27 one - the earlier bracket is used from the time Ford re-designed the front spring hanger/motor mount from two u-bolts to a single "Y" type of mount. Hay John ! tell me about it. I have spent the last three years on this T and still not ready for the road. I really enjoy working on it but the fun has to stop sometime. when It's finished I'll be building a spare engine, trans and rear end . 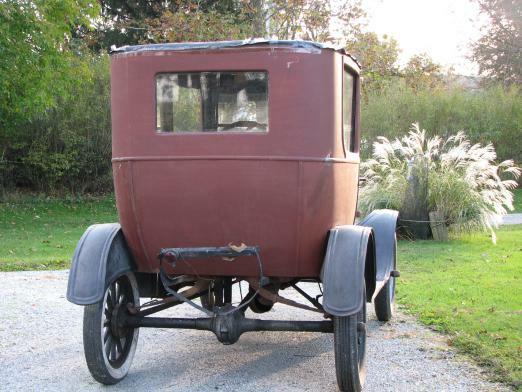 I'm not 100% positive when that tailight assembly came out in '24, but I don't think it was used the entire year. As for the front one, I think that change most likely was made about the same time. 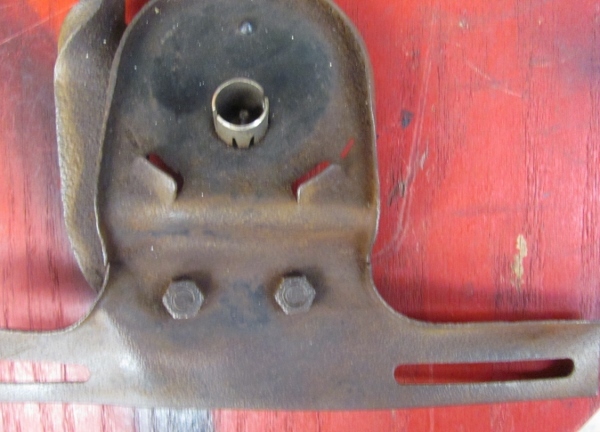 OK Right about that front license plate bracket, thought that was the correct one, but now remember the earlier one piece has rivets holding the bracket members, so this is the correct one for the front of a '24. and maybe if early '24, then the tail lamp may have been the single lamp housing that bolts with a center lug bolt to the spare tire bracket, the tire bracket then has holes for the rear license plate. Lamp has red glass lens and a clear lens for shinning on the license plate. 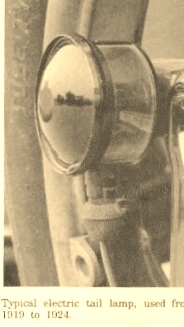 Sometime in the 1924 model year the lamp was changed to the one piece license and lamp assembly. Ken, If you are going to keep the 21" wheels on your Tudor, you will need a 21" tire carrier. 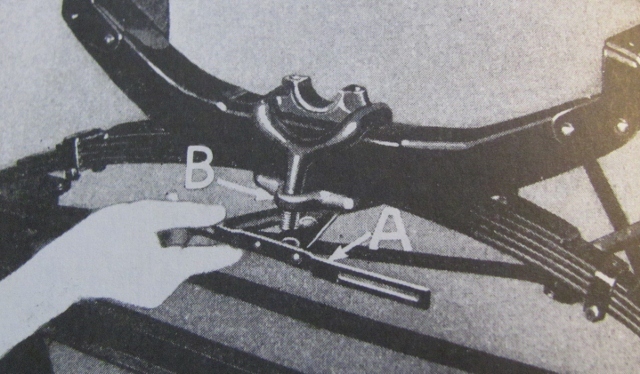 The 21" carrier will have the 2 holes for locating the combination tail light/license plate assembly that is used for 1924-27. I think the 21" tires ride better, last longer, and cost less to buy. The later style tire carrier is easy to identify by the two dimples that were added for each side of the license plate assembly to give that area added strength. The earlier ones don't have that. 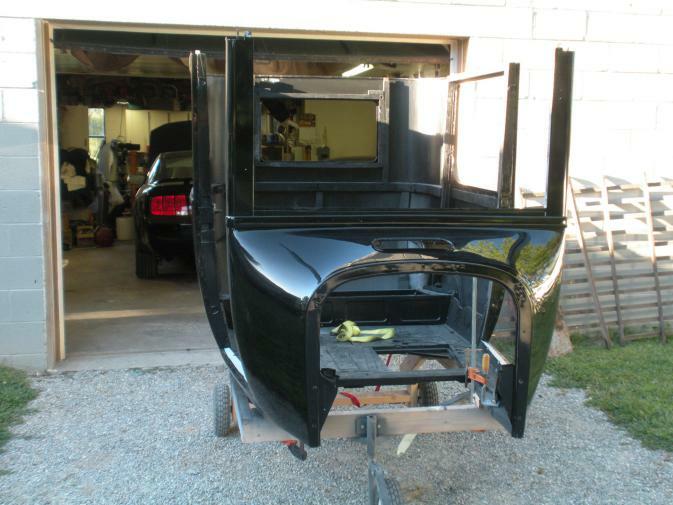 The later style 1924-25 tire carrier for 30x3-1/2 clincher tires has the 2 dimples off to the left on the horizontal rail, as shown on Dan's postings above, The tail lamp/license assembly is bolted through the long slot on the left. Because the tail lamp sits above the rail, Ford punched a hole in the top of the rail to route the lighting wire down. The earlier carriers do not have the dimples or the wiring hole. When the 21' balloon tires came out for 1925, the new carrier for them does not have the long slots, but has two pairs of holes for mounting the tail lamp/license assembly off center, either to the left or the right. There are two holes punched in the top of the rail for routing the wire. The 21" balloon carrier no longer has the mounting holes and stamped depression for mounting the earlier type round cup tail lamp on the left side of the rail. The two stiffening dimples are located equal distance from each side, rather than on the left side of the rail like on the 30x3-1/2 carrier. 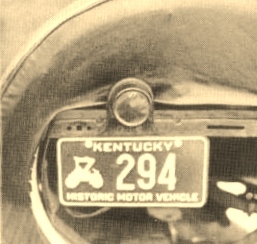 In Dan's postings, the 1924-25 30x3-1/2 clincher carriers are shown just above with the Kentucky license plate, and the rusty carrier near the top of the page. He shows a balloon carrier on the Tudor with the N.Y. license plate. See where the stiffening dimples are located. If I could re-size a photo, I would show the differences.